NASA has selected five proposals for detailed study as candidates for the next missions in the Discovery Program of lower-cost, highly focused scientific spacecraft. Following the feasibility studies, which are due August 15, NASA will select one or two of the investigations in October for full development as the next Discovery Program flights. "This excellent and innovative set of proposals really demonstrates the maturing nature of the Discovery Program," said Wesley Huntress, NASA Associate Administrator for Space Science. "The selected concepts include a mission to a planet, Mercury, that we have not visited with a spacecraft in more than two decades, interesting complements to our currently planned cometary and Mars robotic missions, and the first attempt to gather a sample of particles from the Sun and bring them back to Earth." The five selected proposals were judged to have the best science value among 34 proposals submitted to NASA in December 1996 in response to the Discovery Announcement of Opportunity issued in September 1996. Each group will now receive $350,000 to conduct a four-month implementation feasibility study focused on cost, management, and technical plans, including small business involvement and educational outreach. As stated in the AO, the initial cost estimates will be allowed to grow by a maximum of 20% in the detailed final proposals. These proposals will elaborate on the following missions. Aladdin is a mission to gather samples of the small martian moons Phobos and Deimos by firing four projectiles into the moons' surfaces, gathering the ejecta during slow flybys, and then returning the samples to Earth for detailed study. Aladdin would be led by Carle Pieters of Brown University, and would cost NASA $244 million including launch vehicle and operations. The Comet Nucleus Tour (CONTOUR), a mission to take images and comparative spectral maps of at least three comet nuclei and analyze the dust flowing from them, would be led by Joseph Veverka of Cornell University, and would cost $135 million. Genesis is a mission to collect a sample of the solar wind and return it to Earth for detailed analysis. One of the finalists in the fourth round of Discovery Program selections under the name Seuss-Urey, Genesis would be led by Donald Burnett from the California Institute of Technology, at a total cost of $218 million. The Mercury Surface, Space Environment, Geochemistry and Ranging mission, or Messenger, is an orbiter carrying seven instruments to image and study the closest planet to the Sun. Messenger would be led by Sean Solomon of the Carnegie Institution of Washington, at a total cost of $257 million. The Venus Environmental Satellite (VESAT) is an orbiter spacecraft to study the atmospheric chemistry and meteorology of Earth's cloud-covered neighbor using an imager, near-infrared spectrograph, temperature mapper, and X-band radar. VESAT would be led by Kevin Baines of the Jet Propulsion Laboratory, at a total cost of $173 million. The proposals in response to the announcement of Opportunity (AO-96-OSS-02), were required to respond to the goals and objectives of the Office of Space Science's Solar System Exploration theme or the search for extrasolar planetary systems element of the Astronomical Search for Origins and Planetary Systems theme. The spacecraft must be ready for launch no later than September 30, 2002, and must meet the Discovery Program's development cost (launch plus 30 days) cap of $183 million in fiscal 1997 dollars over 36 months. The concepts under study will follow four previously selected NASA Discovery missions. The Near Earth Asteroid Rendezvous (NEAR) spacecraft was launched in February 1996 on its way to orbit the asteroid Eros in 1999. The Mars Pathfinder lander, carrying a small robotic rover named Sojourner, is due to land on the surface of Mars on July 4. The Lunar Prospector orbiter mission to map the Moon's composition and gravity field, scheduled for launch in September, and the Stardust mission to gather dust from Comet Wild-2 in 2004, are currently under development. Completing a year-long study of Comet Hale-Bopp using the Hubble Space Telescope and the International Ultraviolet Explorer, astronomers are surprised to find that the different ices in the nucleus seem to be isolated from each other. They also report seeing unexpectedly brief and intense bursts of activity from the nucleus. The Hubble observations suggest that the nucleus is huge in comparison with most comets. The findings, by a team of scientists led by Johns Hopkins astrophysicist Harold Weaver, were published in the March 28 issue of Science. "Hale-Bopp will probably provide the most revealing portrait of the workings of a cometary nucleus since the spacecraft missions to comet Halley in 1986," said Weaver. "This is a unique opportunity; we have never had the chance to examine a comet in this much detail, over this large a range of distance from the Sun." 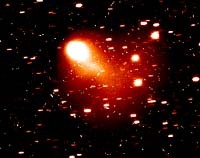 During the course of long-term observations, which began in August 1995, astronomers unexpectedly caught the comet going through a sudden brief outburst, where, in little more than an hour, the amount of dust being spewed from the nucleus increased at least eight-fold. "The surface of Hale-Bopp's nucleus must be an incredibly dynamic place, with `vents' being turned on and off as new patches of icy material are rotated into sunlight for the first time," Weaver said. To their surprise, astronomers found that water ice sublimates at a different rate than the trace ices, implying that those components are not contained within the water on the comet. This conclusion is also supported by Hubble data showing that the rate at which dust left the nucleus was much different than the sublimation rate of water. These observations contradict previous models in which the trace components, such as carbon disulfide ice and dust, are contained inside more abundant water ice in the nucleus, and thus should be released at similar rates. From Hubble Telescope images, the astronomers have estimated that the nucleus may be 19 to 25 miles (30 to 40 kilometers) in diameter. "Average" comets have a nucleus of 3 miles (5 kilometers) or less in diameter. Because Hale-Bopp was unusually bright when it was still well outside the orbit of Jupiter, it has given scientists their best view ever of changes in a comet's nucleus as it heats up approaching the Sun. Those changes provide clues about the composition and structure of comets, which are remnants from the formation of the solar system, about 4.6 billion years ago. Learning more about comets can provide important information about the materials and processes that formed the solar system.